With the landing of the Curiosity rover on Mars, there will be large amounts of raw imagery available to the public from that mission. But it is hardly the first mission to provide this service. The Mars Exploration Rovers, the Cassini orbiter at Saturn, and other missions have also provided raw image data to the public. Some people can take these images and turn them into beautiful works, and can release professional-quality images that would otherwise have never been made, greatly increasing the value of the mission data. I created this image from 3 raw frames from the Cassini mission taken with red, green, and blue filters. I failed to adjust the position of Rhea in each frame, so Rhea appears to be in different places in each color channel. Ultimately I liked the effect and decided to leave it as-is. 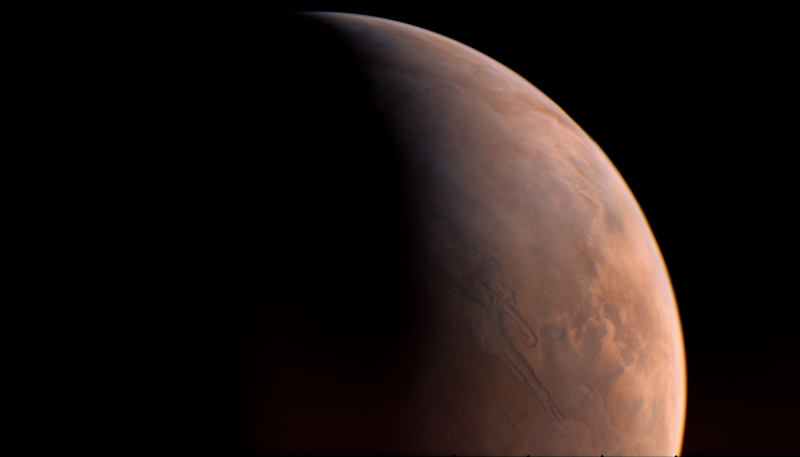 This image was created from 3 adjusted raw frames from the Viking 2 orbiter during its approach to Mars in 1976. 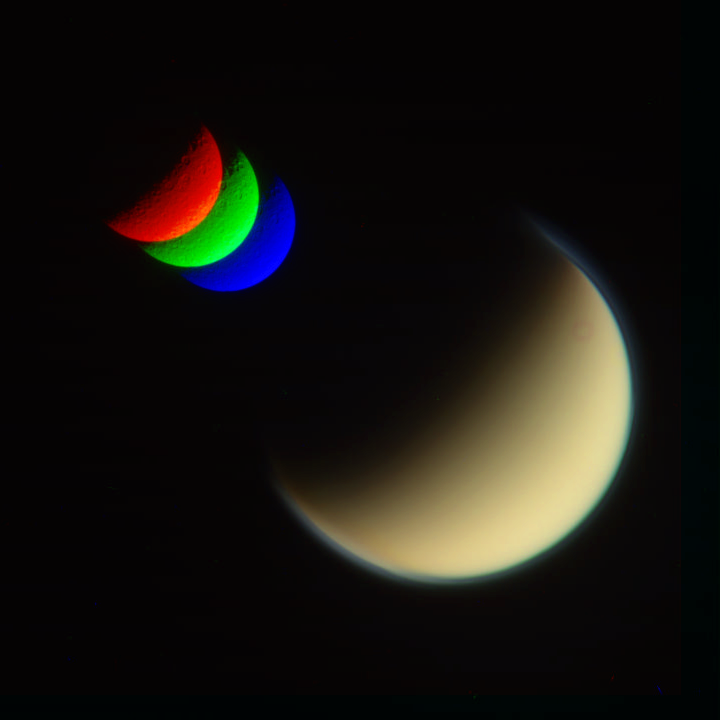 The images were taken using red, green, and violet filters. Some of the calibration dots have been removed. I did my best to approximate true color. 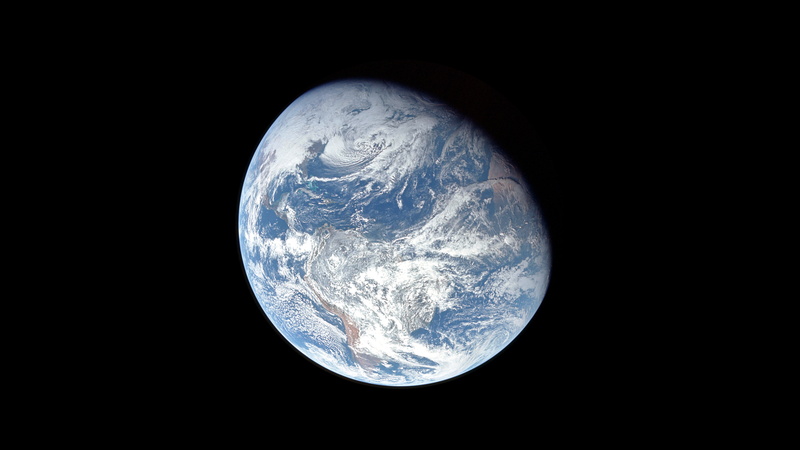 This image was created from an Apollo 8 color film frame, around the December solstice 1968. It has been color corrected and level adjusted, and blemishes have been removed. The planet has been cropped out and the background has been replaced with black. Do you have a link for some raw image database ? Yes! I meant to add links when I posted this, but I forgot. I will edit the OP to include links. 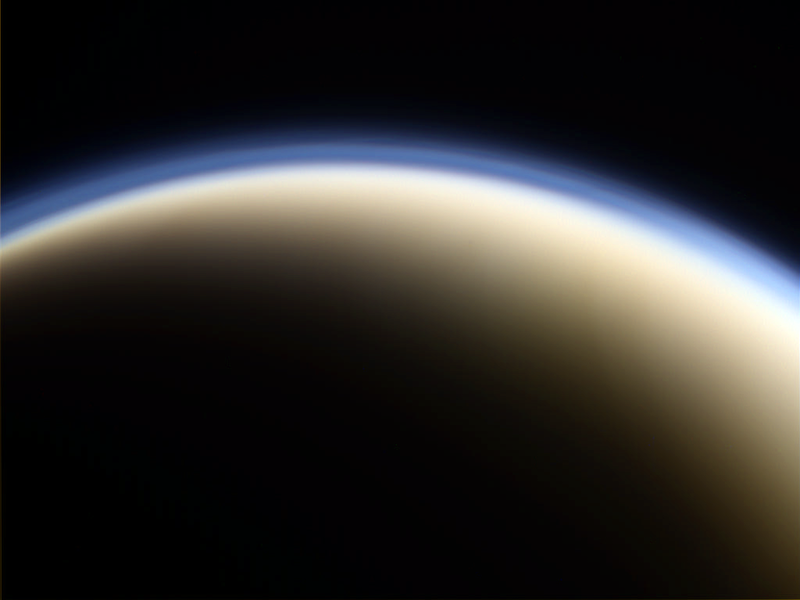 I've created some new Titan images from raw Cassini shots. For each I've also linked the specific raw frames that I used to create it. 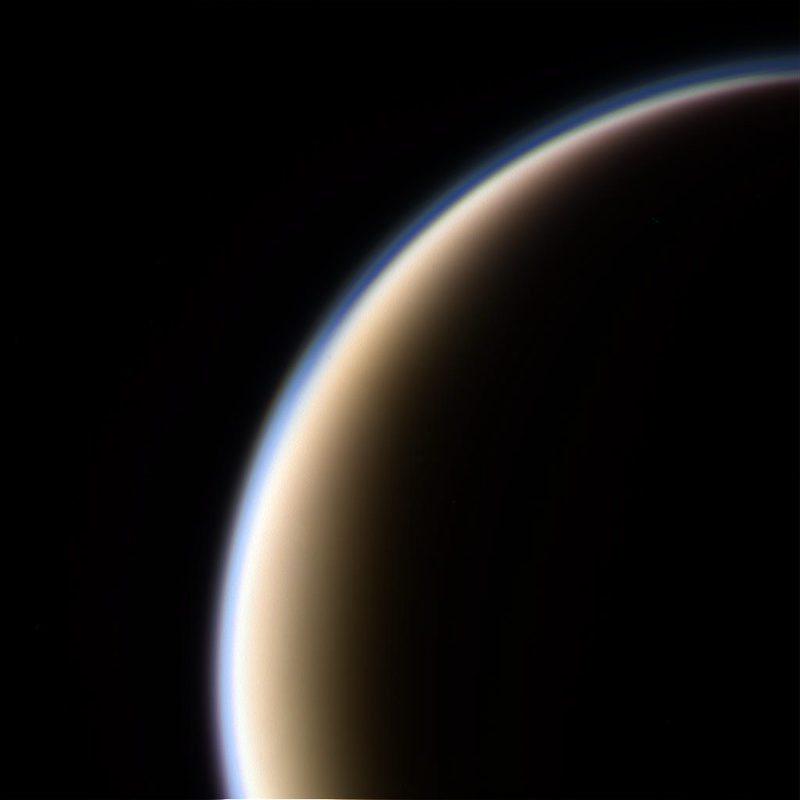 This is a near-true color image of Titan from 25 July 2012, created from red, green, and blue filter images. I had to adjust the brightness of each channel since the exposures seem to have been different, hence the departure from true color. I also had to move the red channel to match the others. There is still a small offset because Titan is different sizes in each frame, but I didn't care enough to correct it. 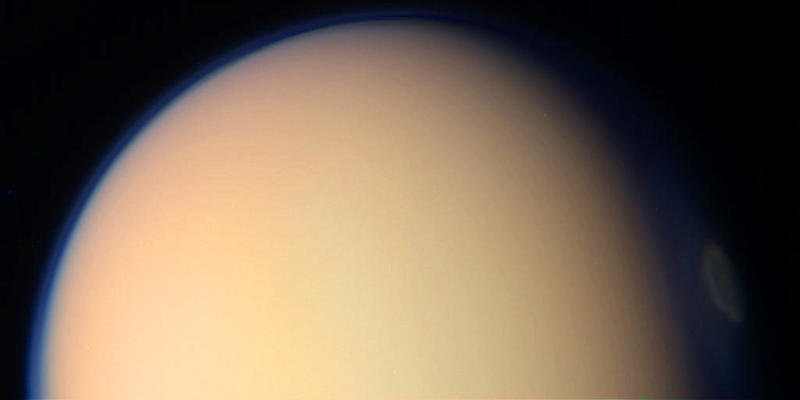 This is a true color image of Titan from 24 July 2012, created from red, green, and blue filter images. I adjusted each frame so that the background would be black, I moved the blue image so that it would align properly, then I cloned out the hot pixels and defects from the final composite. This image was extremely easy to do. If anyone wants to try this for themselves, I recommend doing this image. The only thing that needs to be done is to compose an RGB image from the red, green, and blue color frames. And that's all. No alignment necessary, no color adjustments necessary, no level or contrast adjustments necessary. In my image I have cloned out a few hot pixels and increased the saturation, but those are very minor changes. What is it - a cloud-like spot on the right dark side on the first image? 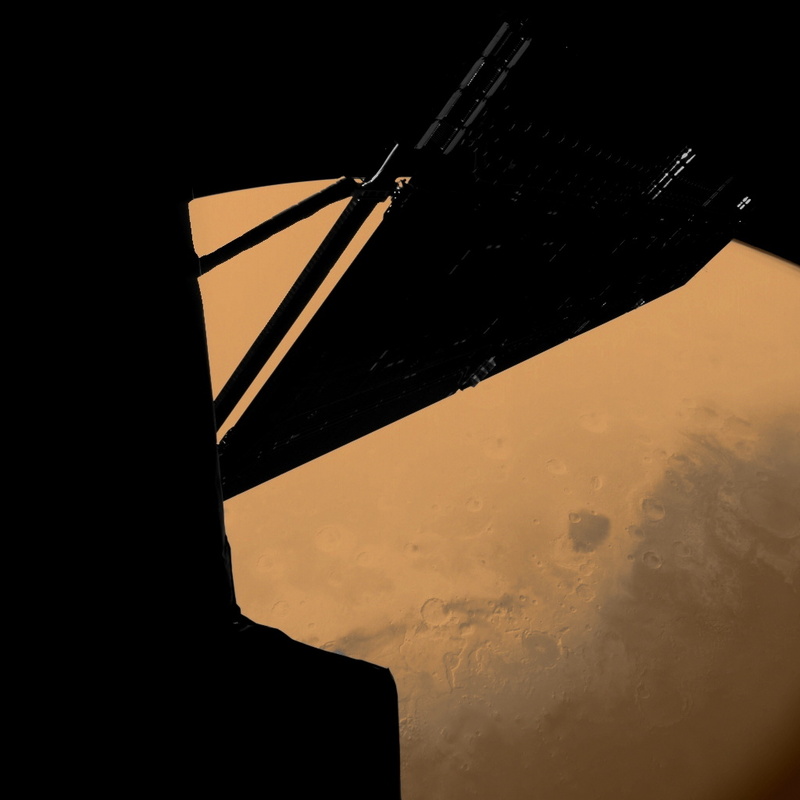 It looks almost as if you're looking out the window of a spacecraft arriving at Mars! That's not Mimas; it looks like Rhea, though I'm not sure. I think its Mimas as it has that large crater on the top left of the sphere. That is not Herschel crater; Herschel is much bigger relative to the moon, and located differently. Several of Saturn's moons have similar craters. Mimas has a much rougher and more cratered surface than that, and is also smaller and not colored like that. These all look fantastic. Don't have to means, tools, or time to do this myself though so keep the awesome pictures coming. I require more images for my space images folder. I require more images for my space images folder. I have an old IDE hard drive I put in an external shell, 100GBs. I got a backup drive thats 500GBs so I didn't need the 100 anymore so I just had a download of high resolution NASA images go to it. I pretty much filled it up but I still have a couple GBs left. Uncompressed NASA images are really really large, couple images are over 300MB(not of other planets the very large images are of Earth and the moon). Uncompressed NASA images are really really large, couple images are over 300MB(not of other planets the very large images are of Earth and the moon). Maybe we should make an off-topic discussion so everyone can compare their respective Space collections?